Why do we need a letter of completion of work? Construction and other industrial projects (oil and gas, mining etc.) are extremely hard work. Projects can span for many years, and involve thousands of moving pieces and interdependent parts. These projects are already extremely risky for all parties, involving large bets which can be quickly derailed by unexpected delays, quality issues and more. So when one of these projects come to an end, all parties involved are ready to seal the deal and issue their letter of completion for work. A letter of completion of work is issued and signed by project parties when the contractor is deemed to have completed all of the construction works contained in the contract. The main reason we need a letter of completion for work in these construction and industrial projects is so that the project can be properly handed over, and so that liability and responsibility is handed over too. Letters of completion and these type of documents serve as the mechanism with which parties agree that that phase of the project is closed out - which is critical for disputes, contractor performance assessments and other important outcomes. While we won't get into the mechanics of latent defects here, is it important to know that the letter of completion of work isn't necessarily the 'end' of the project. Even so, signing off on a letter of completion of work is an important milestone, and managing the letter of completion process smoothly and professionally can have a big impact on stakeholder relations and how well and legally the contract and project is closed out. Because of this, you'll find a letter of completion of work sample below, as well as a more modern approach to letters of completion. Both methods and frameworks can be used to improve how you manage the completion of work procedures. Many construction and industrial projects still use physical or email letters to manage these type of important communications. And these letters do a great job of establishing the formal communication required to communicate these milestones. 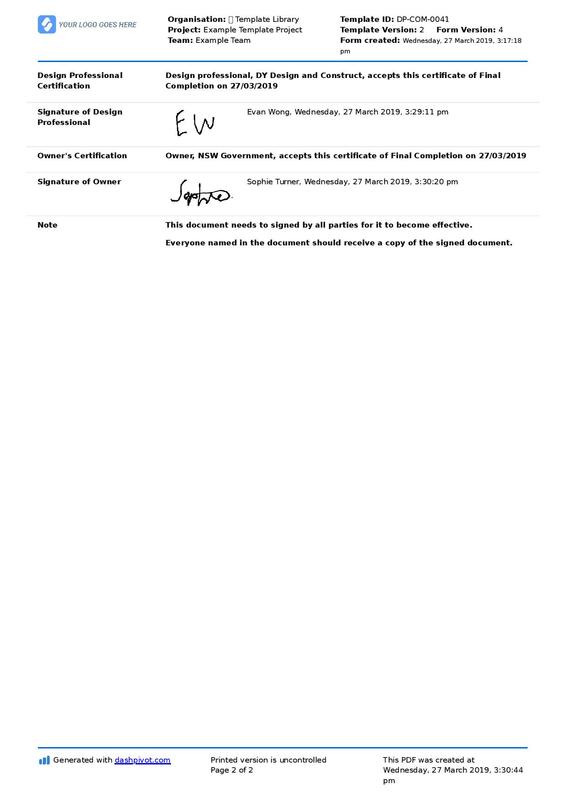 The letter of completion of work example below, which is often called a certificate of completion in construction, serves to eliminate these issues by turning your letter of completion into a smarter digital document - which more closely resembles your other important project information. 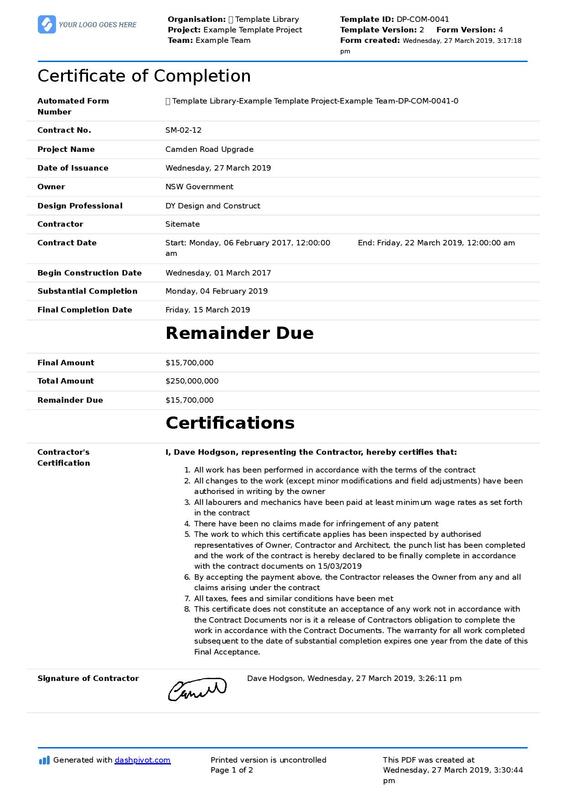 The letter of completion of work example below comes pre-built with all of the detail all parties need to effectively certify that the project has been complete. Every letter of completion requires all of the important project details in the first section, the critical financial information in the second section, and then the official certifications and sign offs from the project parties. You can view this 'better' letter of completion of work example by hovering on the document and expanding it, or keep scrolling to find the more traditional letter of completion of work sample. Use and customise this smart letter of completion of work framework for free. As was previously mentioned, some construction and industrial companies do still lean on and rely on traditional methods of communicating these project phases and milestones. The letter of completion of work sample below showcases what one of these traditional communications looks like. You'll see some of the same information from the example above dotted through the sample, including important project dates and the remaining payments due. But as you can see, it's much more difficult for the contractor and other parties to include and consolidate all of the important information into a letter. Some companies supplement project handover checklists with sample letters like this, while others attach important supplemental information in PDFs etc. We are pleased to inform you that we have been able to complete the construction work before the final completion date of [Insert final completion date]. We signed the contract of construction works that began on [Insert beginning date] and ended on [Insert end date]. We would like you to please clear our previous pending payments left with you so that we can move further to our final settlement of [Insert remainder due] with you at the completion of the work. Please see attached for our Contractor's Certification. Unfortunately, using a sample completion of work letter like this does still require the back-and-forth of email and letters. Many companies have levelled up with these documents, and now use digital documents and workflows which can be collaborated on in real-time. These saves the communication headaches, and keeps all records in a digital format which can't be lost or disputed. However you go about creating and issuing your letter of completion of work, it's important to create a standardised and professional document and process for it. Every stage of a construction project (or any other project) is important, all the way from invitation to tender letter - to the letter of completion of work. Documents and forms are the lifeblood of project communication and the lifeblood of your business. Make sure you close out your projects effectively, and get prepared for the next one. This project handover checklist template ensures you have taken all of the neccesary handover steps, and documented all of those steps too.